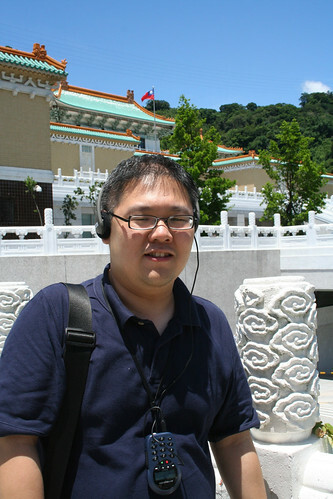 On the 6th of August, I arrived in Taipei at 1.30pm after a 4 hours flight from Singapore. Got a ride from company limousine to office. Started the day meeting up with my friendly counterparts. Their smiles and their sweet tone make you feel welcome. You really feel really good with their company. 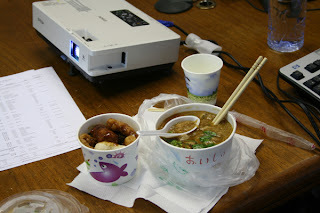 They bought me snacks which consist of “O luoi (Oyster) Mee Sua” & “mix fish cake in sweet sauce” , after noticing that I have not taken my lunch. Check-in into Sherwood hotel in the late evening, after my work. Sherwood hotel is a grand hotel (5-star). The hotel has a victoria decor which makes the place looks elegant & stylish. The room is big and it has all the necessary toiletry. The only problem with this hotel is that it is not convenient. 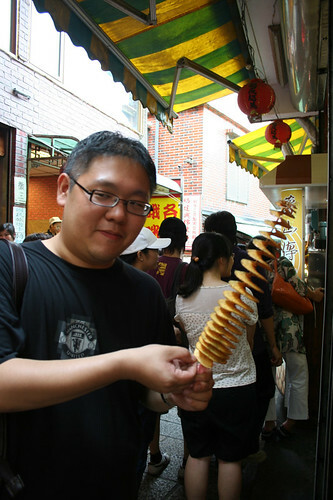 It is no where close to any of the famous night markes or street stalls. 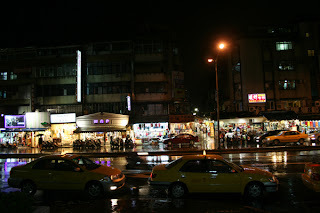 Surrounding the hotel are steaks houses, pose sushi restaurent and branded coffee joints. 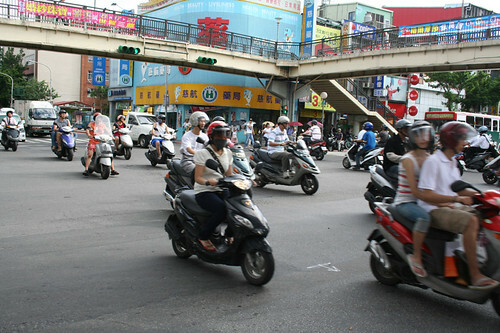 Despite the inconvinience in getting cheap food around the hotel, the location of the hotel allows one to travel by Taxi to nearby Night market like Shihlin & Raohe St with ease. 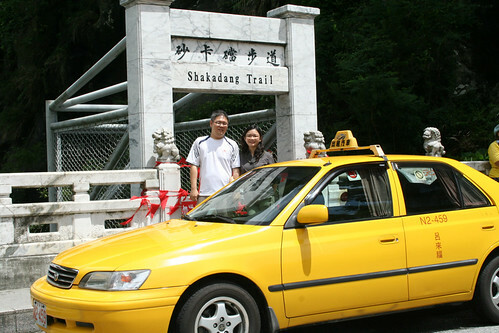 By taxi, it should cost you not more then NT$140 (SG$7). 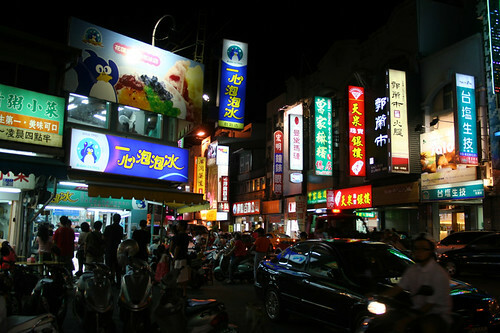 During my 3 days stay in Sherwood, we have visited the shihlin Night market and Raohe Street Night market. 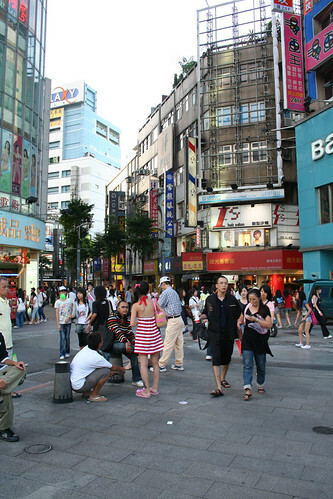 Though in most forum we have noticed people making different trips to different night market every night, I felt that visiting a single night market should be sufficient. 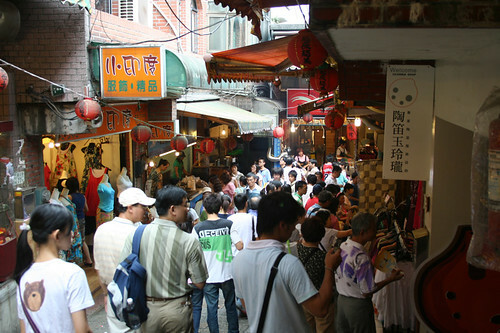 The Shihlin Night Market is one of the night market that is worth visiting. 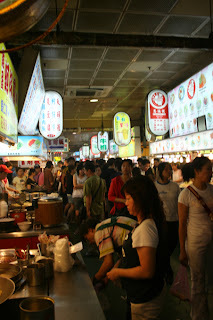 I personally felt that you should spend more then a day venturing around the shihlin Night Market. 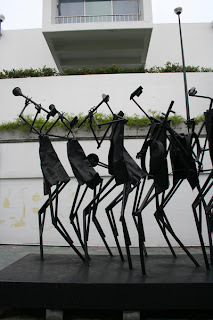 During the day, while I am working in taipei, my wife visited the Taipei Fine Arts Museum. From the report I gotten from my wife, the display in the museum has some fine works. For those who is interested in arts and design, you should be making a trip to the museum. 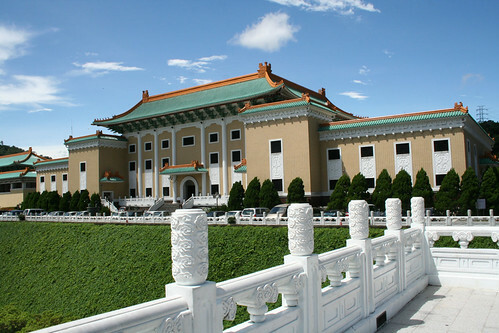 The museum is located on Zhongshan North Rd Sec 3, and it is a short walk from Yuanshan MRT station. 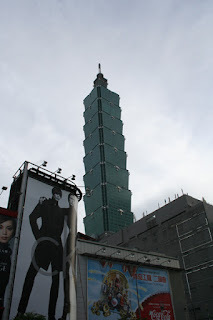 In the afternoon my wife visited the vicinity of Taipei 101 & City Hall. However, due to the high cost of merchandise in the area, my wife did not enjoy shopping in that area. 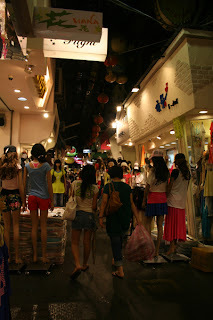 In the evening she visited Wu fen pu which have a range of clothing at wholesale price. 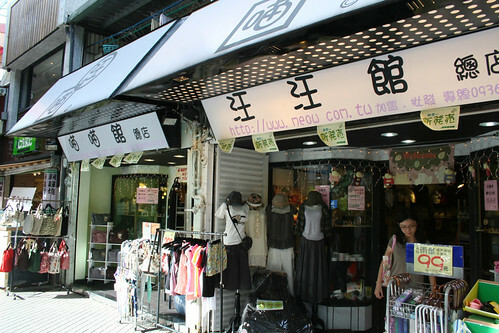 As there are many shops in that area, it is recommended to spend 2 hours or more in this area (for those who enjoy shopping). 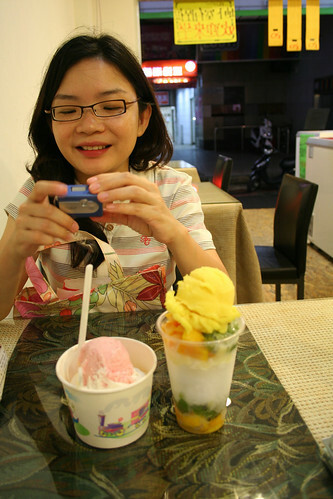 After shopping at Wu fen Pu, my wife met up with me at Songshan Railway Station, which is near Wu Fen Pu. 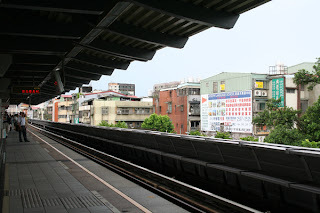 We cross the overhead bridge across the SongShan railway line to Roahe Street Night Market. We were not very impress by Roahe night market as compared to Shihlin night market, despite the wide array of food offering at the night market. 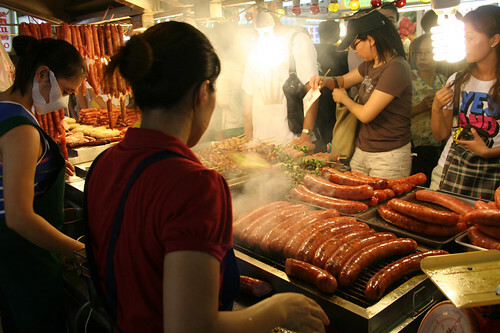 Probably, as what most people say – Shihlin Market is the best of all Night Market. 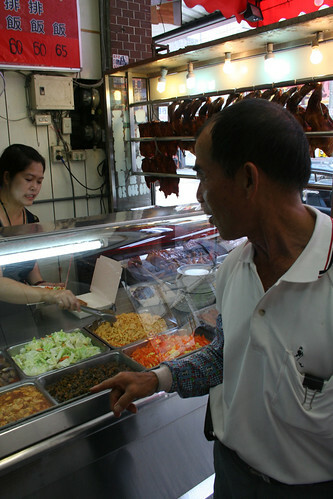 To my opinion, Shihlin Market is the best, due to the wide array of food stalls as well as cheap and interesting merchandise (mix of both legal shops & illegal peddlers). 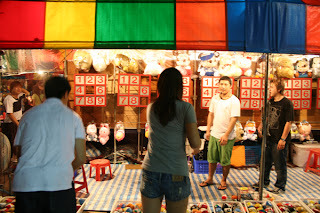 I didn’t know that sheet peddlers are illegal, until I witness all peddlers running off with their stalls at different directions..Off the record, me and my wife went to Shihlin Night market on 2 separate occasions. Once we check-in to the hotel, we immediately start to pay close attention to the news. We receive reports from our friend that a typhoon is going to hit Taiwan on the day we have planned to go up to Halien (day 4 – next day). Seeing that the chances of a typhoon is high, we decided to postpone our Halien trip to Day 5. We took a walk to Central train station and spend nearly an hour in queue before we reached the counter. We manage to change our train ticket from morning departure to a night departure on day 4, hoping that typhoon will pass taipei in Day 5, while we are in Halien. 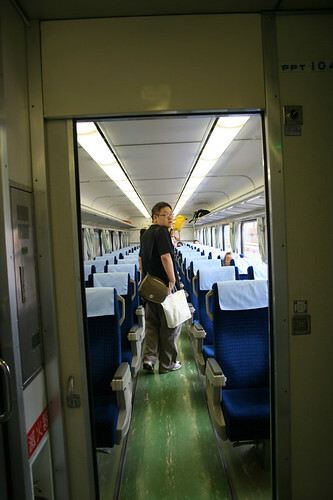 After making the neccessary arrangement, we took a train to Xi Men Ding to chill-out and for my wife to do some window shopping. 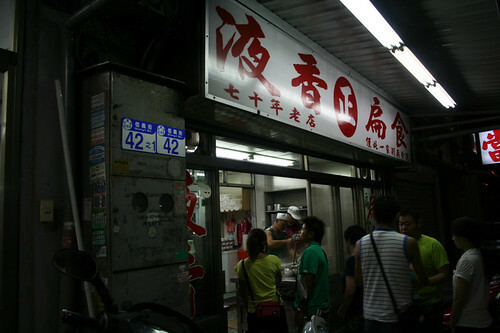 Xi Men Ding looks very much like a mini Shinjuku in Japan. 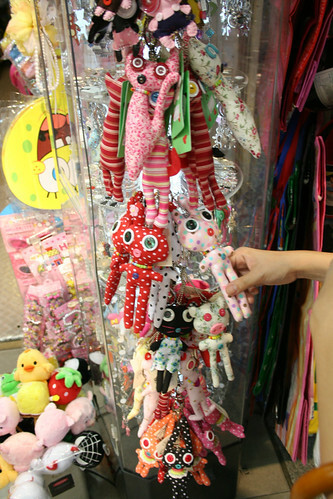 There have many shops selling clothes and Ka-Wa-Yi stuff (for the gals). However, we felt the price in Xi Men Ding is a bit expensive. 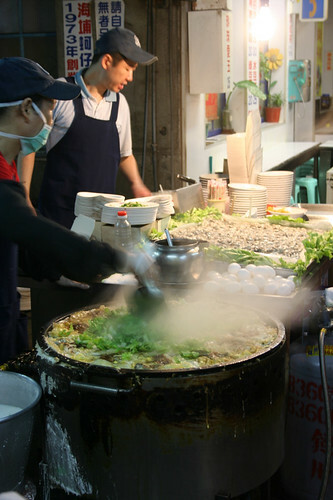 One of the must-do in Xi Men Ding is to try Ah Zhong Mian Xian (Noodle soap). For direction, just ask around. Every locals will know where is it. Interestingly, there is no table or chairs in the shop. 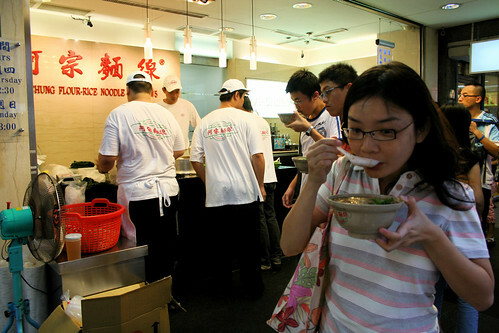 You basically buy a bowl of Mian Xian and stand around the vicinity to eat. 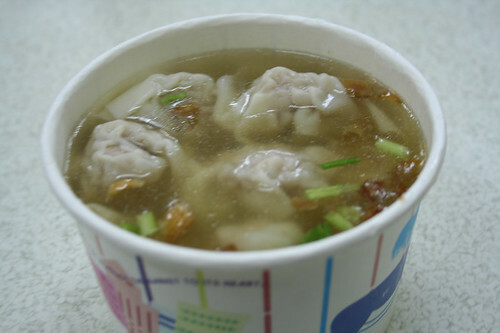 We love the Mian Xian. 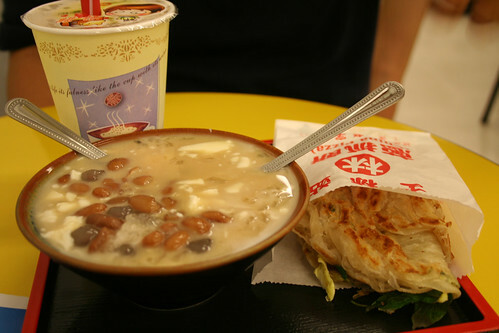 It taste like shark fin soup with very fine noodle. 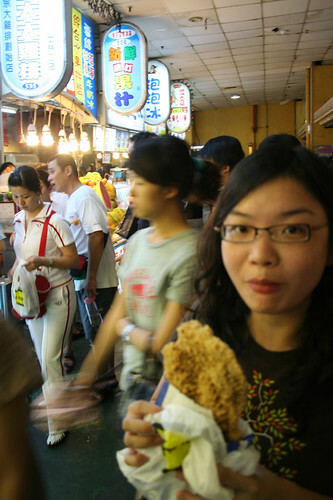 The only awkwardness is standing in the middle of the street, with a bowl in the hand, eating the Mian Xian. The feeling is like standing in the middle of Orchard Road, eating a bowl of porriage. 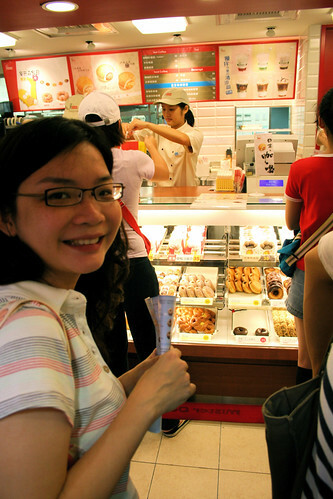 We love the donut in Mister Donut. 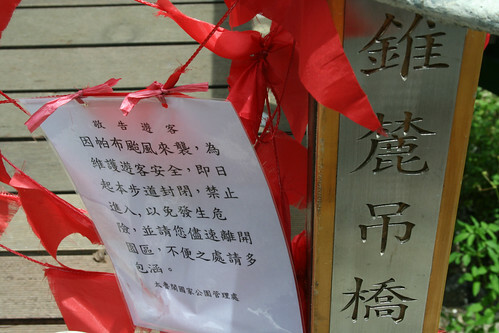 It is next to Ah Zhong Mian Xian. The donut is not too sweet and has a QQ (Crewy) texture. We spend about 4 hours in Xi Men Ting before walking back to our hotel dropping into the many book shops and snack shops along the streets. Sunny Weather today! 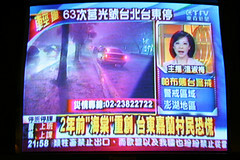 We were anticipating heavy rain due to the forecasted Typhoon. After a breakfast, we took a train to Shilin Station MRT. 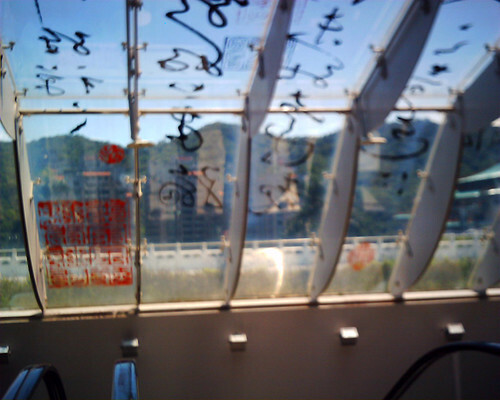 We took a public Bus (Red 30) to the National Palace Museum. We reached there at around 10am. Purchased the ticket and got ourselves a commentary headset. I am impressed with the extraordinary collection of historic art treasures, fascinating for its depth and breadth, which has miraculously escaped destruction over hundreds of years. Looking at the exhibits, I am trying to imagine each of the exhibits being placed on the shelf in the Forbidden Palace in China. With my little knowledge of the Chinese history, I am trying to adsorb and learn all about the MING, the ZHOU dynasty etc… I know I learn something, but after leaving the Museum, I do not remember anything. We spend 6 hours in the Museum from 10am – 4pm. Though we hope to spend a bit longer in the Museum, we have to leave the place, as we have a train to catch for Hualien in the night at 8pm. We left the hotel in the evening, leaving bulk of our luggage with the Hotel. 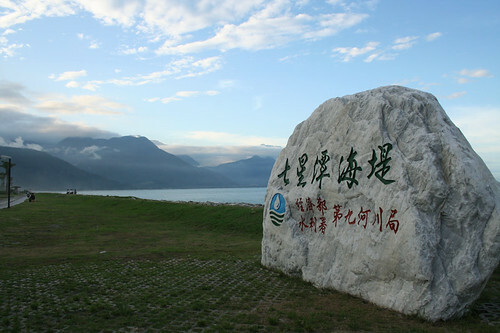 We have planned to visit Jiu Fen during our return from Hualien to Taipei. 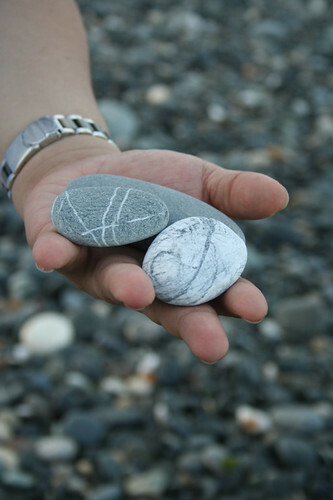 Therefore, it is crucial that we are traveling light to move around. 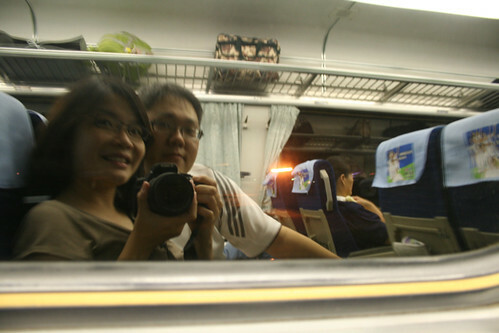 We caught our express train to Hualien at 8pm. After 2.5 hours of journey, we reached Hualien at 10.30pm. 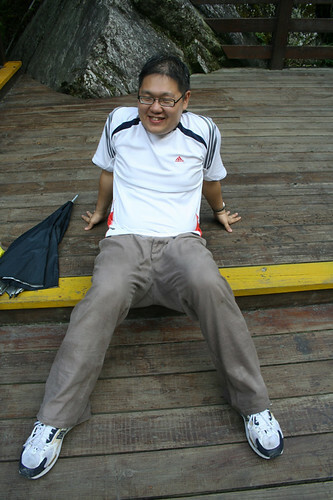 Our tour guide Mr 呂來福 met us and brought us to Roseland Minsu. 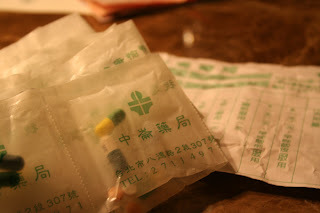 More on 呂來福 on the next thread. After having a light but satisfying breakfast in our lodge, we waited for our guide, Mr Looi, to pick us up to our 1 day tour to Taroko National Park. 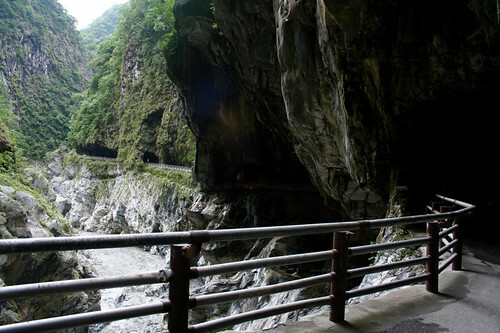 Mr Looi arrives shortly and we make a 1/2 hour trip up to Taroko. 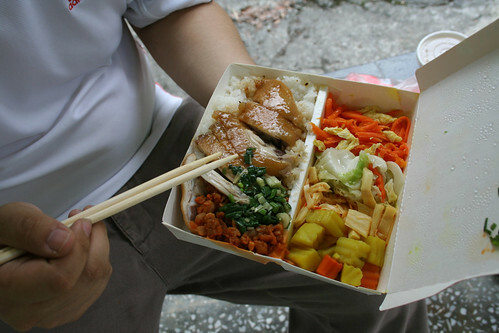 On our way up to the National Park, Mr Looi bought lunch box and snacks (banana & sweet potato) for our trip. Our first stop was Shakadang Trial. 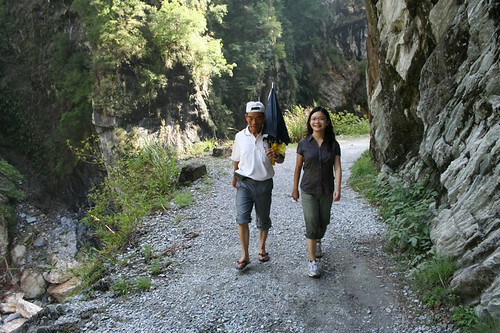 It was suppose to be an interesting trails that allows you to walk along cliff and river. 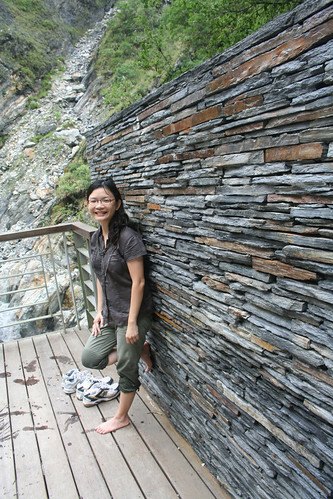 This trail is built along the river cliff so travelers can easily observe both the rock folds and plant ecosystem beside in the river valley. To our disappointment, the trail was closed due to the recent Typhoon. Seeing our disappointed face, Mr Looi assure us that we did not miss much. 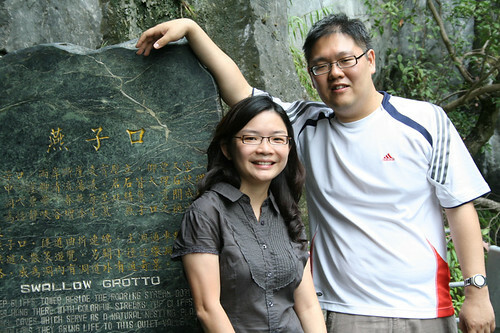 The next stop we visited was Yanzihkou trail (Swallow Grotto). Over here, we walk along a towering cliff, while the river on our right, runs its swiftest and the distance between the gorge walls so narrow that they almost seem to touch each other. 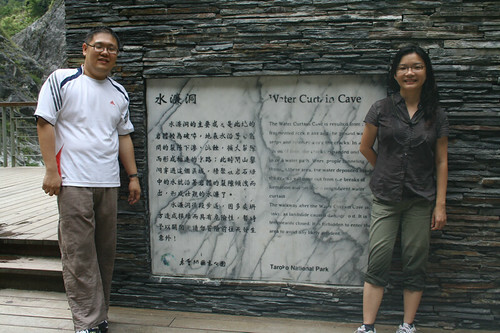 Next we visited Jiucyudong (Tunnel of Nine Turns) Trail. 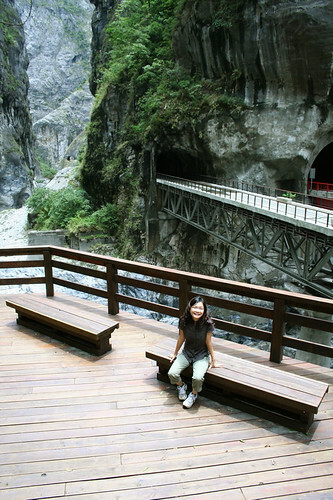 This is the most magnificent part of Taroko Gorge, where the sheer cliffs face each other. You can observed rock folds, joints and faults of the marble cliffs as you navigates the tunnels. The two cliffs are so close to each other, and it looks like they are joining to each other if seen from afar. The distance between the cliffs is only around 10-meters wide. 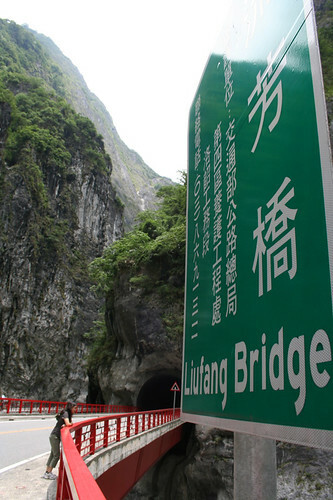 Traveling along Central Cross-Island Highway, after passing Jiucyudong (Tunnel of Nine Turns), we arrive at Cihmu Bridge, which is an H-Shape hanging bridge with marble stone lions on each end and with marble lotus stones on two sides. There is a pavilion near the bridge and that is the place that we stopped for our lunch. 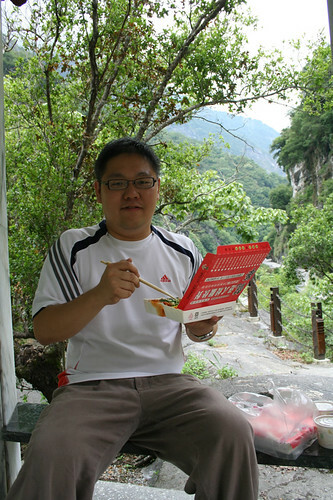 A breathtaking view of the rivers and marble valley while eating our lunch boxes bought by Mr Looi. 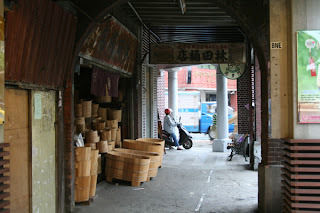 After Lunch, we made our way to Lyushui and Tiansiang, where we stop for a coffee break before heading back down Taroko. 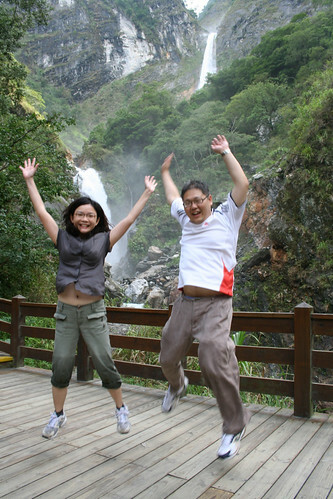 The highlight of the tour is the Baiyang Waterfall Trail. To Mr Looi, it is going to be a “surprise” for us. Before, we began our tour, he gave us a umbralla and a raincoat. He said it is neccessary, without elaborating more, except assuring us that it is going to be a “surprise” for us. After walking about 30 minutes we finally arrive to our first surprise destination. It is a tunnel. As we go deeper into the tunnel, it gets so dark that we are unable to see what is ahead of us. 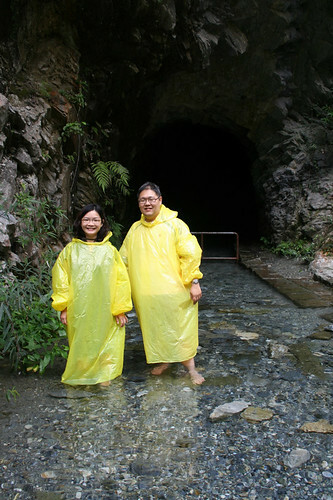 On Mr Looi’s instruction, we walk along the cliff wall, feeling our way through the tunnel. He told us that it was more exciting walking in the dark, through the tunnel, then using a torch light. In fact, along the trail there are about 3-4 tunnels. Some of the tunnels are as straight as a pencil and you can see the light at the end. Others however are curved such that you will be enveloped in pitch-black darkness. After walking through the tunnel a “Shangri-la” greated us at the end of the tunnel. A the lovely green mountain view greated us on our exit of the last tunnel. 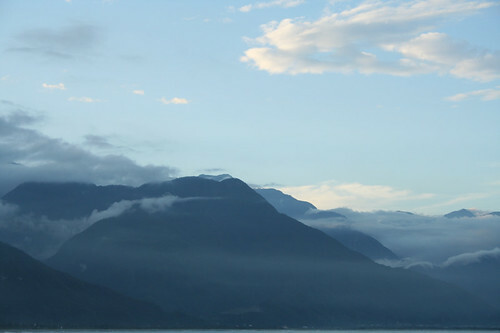 It was like entering into a chinese painting painted by a grand master. 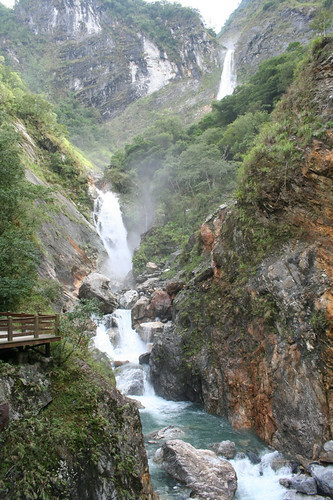 A 360 view was Cliff, Waterfalls, rivers and hanging bridges. After resting and venturing around the oasis, we make our 45minutes walk back to the taxi. 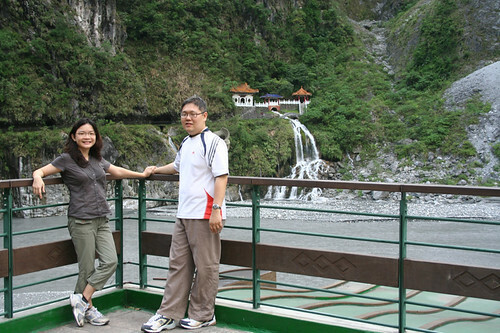 Before exiting Taroko, we visited Changchun (Eternal Spring) Shine and surrounding. 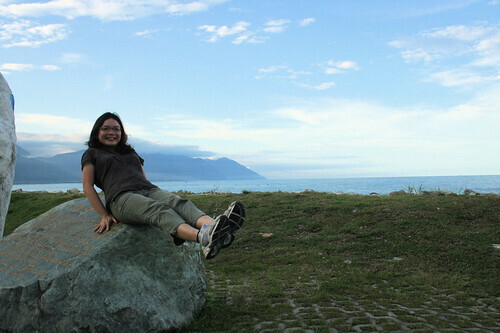 Next stop, before harding back to Hualien, we stop by Seven Star Beach 七星潭. 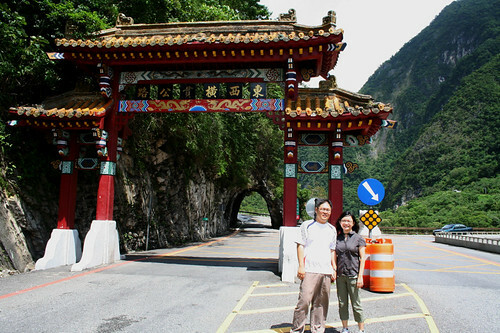 Today we leave for Hualien to Jiufen (九份). 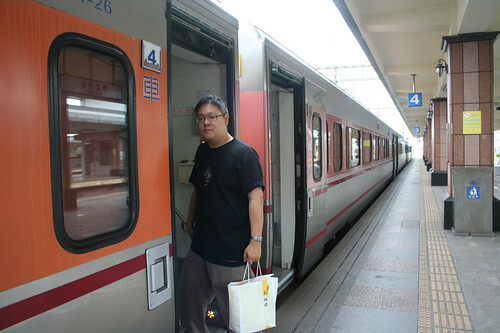 Mr Looi picked us up from our lodge and drove us to Hualien Train station. We took the 9am train to Riufeng (瑞芳) train station. The journey took 2 hours. 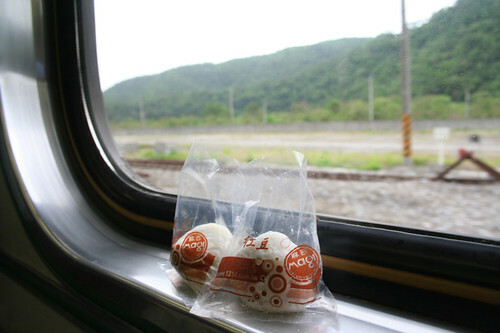 It was a pleasant train ride, given that we did not manage to see the scenario, due to our night journey, on our way to Hualien from Taipei. 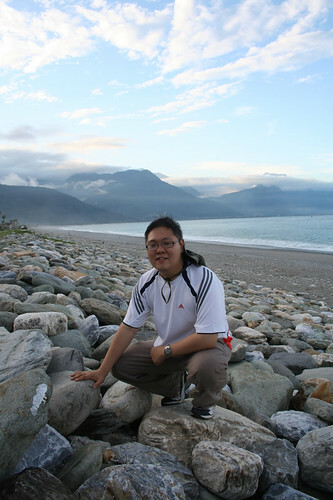 One more thing… Please make sure you buy the muchi from Hualien before you depart… This is something you should not miss when you are in Hualien. We reached Ruifeng train station in the late morning. What a crowd today! School holiday season and a queue was formed in front of the bus stop. 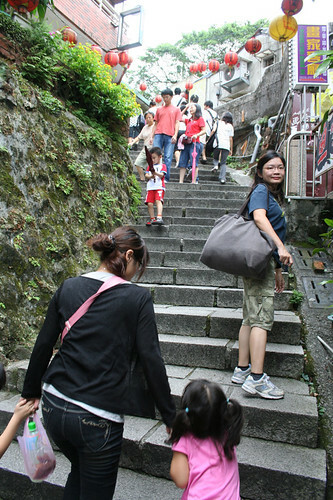 Well… not a bad thing for the crowd, as least I will not get lost making my way to Jiufen. 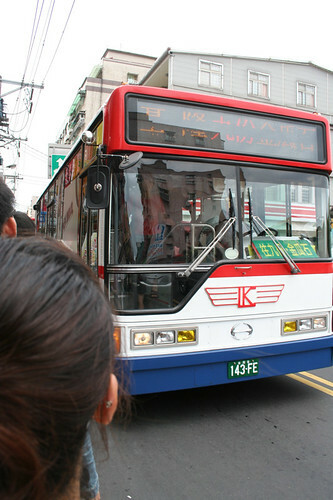 Following the queue, we board the bus to Jiufen. 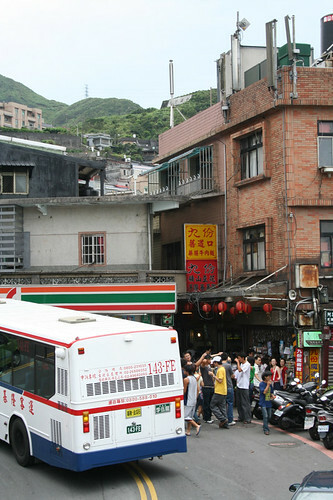 It is amazing how the bus navigates up the narrow road up the mountain town of Jiufen. 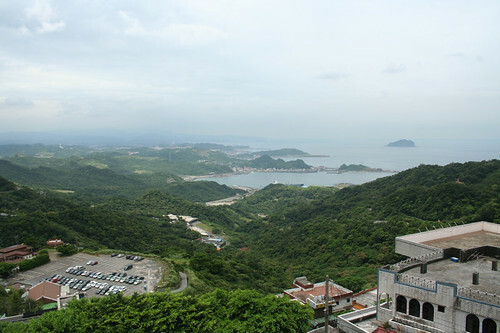 The town of Jiufen is built into the side of the hills slightly inland from the Pacific Ocean coastline. 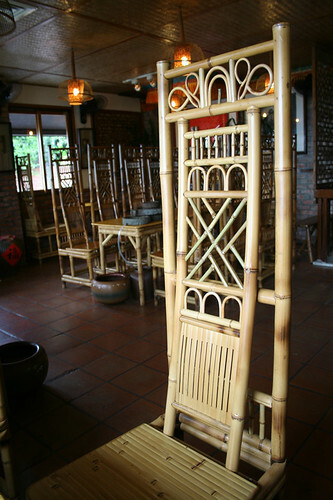 The town is filled with tea houses and has a stunning views of the pacific ocean. 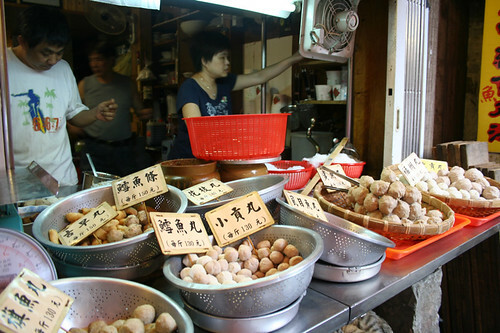 Break time for some fish balls..
My wife being an fan of Hayao Miyazaki, went searching for the tea house that was used as a model in the anime movie – Spirited Away. 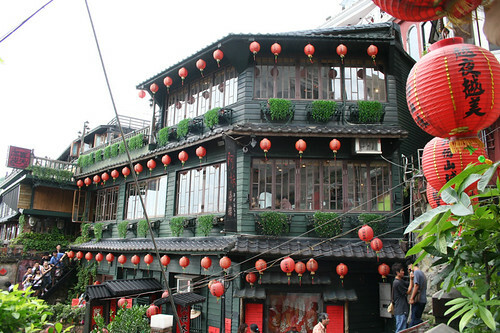 The architecture sight was interesting, however, we make a mistake by having a drink at that tea house. We felt that we paid a tourist price (too ex) for a cup of fruit juice (S$10). 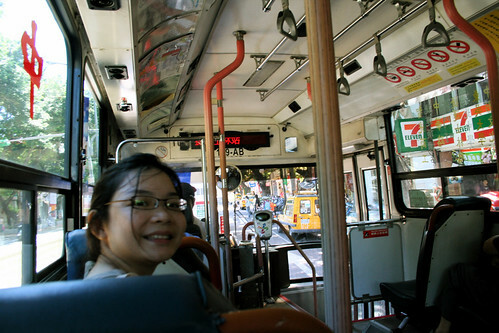 After wandering and snacking on the street of Jiufen, we departed the town by taking a bus to Keelung where we transferred to a MRT back to Taipei. 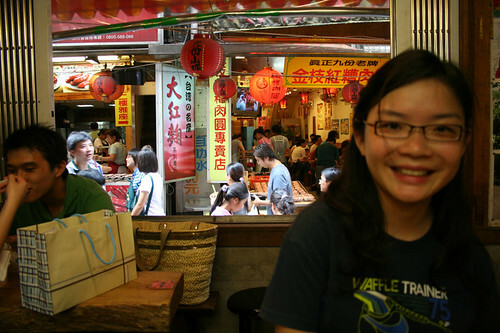 We did wanted to stop by Keelung to visit the night market, but we were too tired for it. 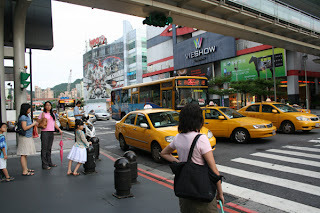 We reached taipei at around 6pm. Last day in Taipei. Mary left at 7am for the 9am flight on Jetstar while I left at 10am for the 1pm flight on SQ. Thank you Mr Looi and everyone in Taipei! hi!happy to read your blog. May i know how to contact uncle 来福？beside contact no.